The Roll-a-Ramp rollup portable track ramps offers a pair of 12" wide tracks which are lightweight, durable and available any length needed. Designed for maximum portability, the roll up design makes Roll-a-Ramp portable wheelchair ramps convenient to store and set-up. To use, roll out the track and then set the track ramps in place. 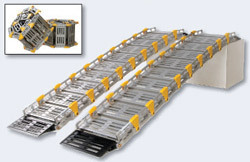 Roll-a-Ramp's unique design allows for unlimited lengths although supports are required for lengths longer than 12'. Should more length be required at some point in the future additional sections can be purchased and added to an existing ramp eliminating the need to purchase a new ramp. The design of this wheelchair ramp is such that the ramp is actually 12" longer than the length ordered because 6" of the ramp must be on the top surface another 6" on the bottom surface. So when a 6' ramp is ordered the actual length will be 7' when delivered. No other company in the nation can boast a warranty like Roll-A-Ramp's® 10 Year Unconditional Warranty. Should you ever have an issue with your Roll-A-Ramp®, ("issues" are extremely rare), Roll-A-Ramp® will replace what's needed. Ramp rolls up to make storage & transporting easier.